A deliciously spiced up version of this traditional soup. Look for organic carrots, which tend to have more flavor and sweetness than regular carrots. Or pick up beautiful carrots at your local framer’s market. The cashew cream goes wonderfully with this soup but you can always take the shortcut and simply use heavy cream or table cream as a garnish. Danielle demoed this at the US Botanic garden February 20, 2014. In a 6 to 8 quart pot, heat the oil and add the onions and sauté until golden. Add the carrots and the remaining ingredients, through red pepper flakes. Deglaze the pan with 1 cup of the vegetable broth. Add about 2 cups more of the vegetable broth (enough to cover the carrots by one inch). Cook until carrots are tender, about 20 minutes. Puree the soup — either in a blender, in batches, in a food processor, or with an immersion blender. Add additional liquid to reach the desired consistency. Reheat slowly; adjust the taste — perhaps a little more lemon, maple syrup, salt. Grind the cashews in a food processor or blender, add the water, lemon juice, nutmeg and salt. Blend until very smooth, about 2 minutes. 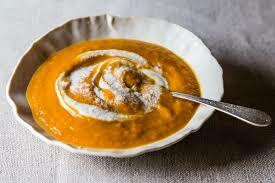 To serve, ladle the soup into bowls and drizzle with cashew cream. Serves 4-6. This entry was posted in Recipes from Danielle's pantry, Soups and tagged carrots, cashews, ginger, lemon, vegetarian. Bookmark the permalink.